Good news, Service Pack 4 for Windows 2000 works well with SBS 2000. I have installed it on a number of machines with no problems at all. There is one caveat (isn�t there always). If you have any patches or hot fixes directly from Microsoft PSS read Microsoft Knowledge Base Article � 822384 before you try to install SP4, there are big issues. My installations went very smoothly however, I did not have any of the afore mentioned fixes present on the machines I upgraded. It is a big patch (130Mb) and took quite a while to install. It was 44 minutes from the time I started the executable until the desktop returned from the reboot on my in house system (P-4, 1.8Ghz with a gig of ram). But no errors from the install or since, KOW (knock on wood). On a later install to a P-4 2.4Ghz system also with a Gig of ram it took about 20 minutes to get the icons back. You can get SP4 HERE, it comes in two flavors. The single install which loads a small exe that checks what you need and downloads just those parts and the Network Install which brings down the entire 130 Megs. If you still have W2K clients I'd do the Network Install and that way you can also push SP4 out to them without have to re-download it each time. 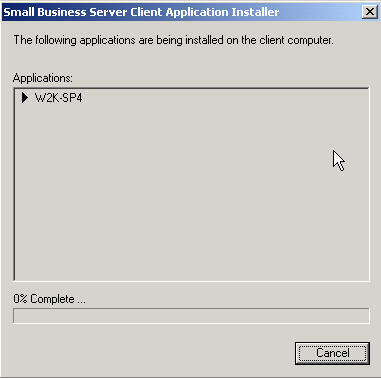 From the ToDo List in the Admin Console click Define Client Applications, then enter the network path to the SP4 files. Make sure you don't put the local path or it will not work. Here is what it looks like on my system, note the trailing /q which tells the SP4 installer to run in quiet mode. on my P-4 2Ghz desktop that box sat there for 16 minutes without any sign of life. Then when it's finished it reboots the system. So you need to decide if you want dialogue boxes popping up for the user mess-up or just this plain little box sitting not looking alive for an extended amount of time. I prefer the latter as it has less chance of someone clicking the wrong choice. Just make sure to warn them before rolling this out that it will look dead for quite a while. They of course do get the choice to postpone the install until later as with all software pushed out in this manner. Of course you could also push it out with a Group Policy but I think that based on it's size that would be a little rude. But however you get it out there is seems like a pretty stable patch. 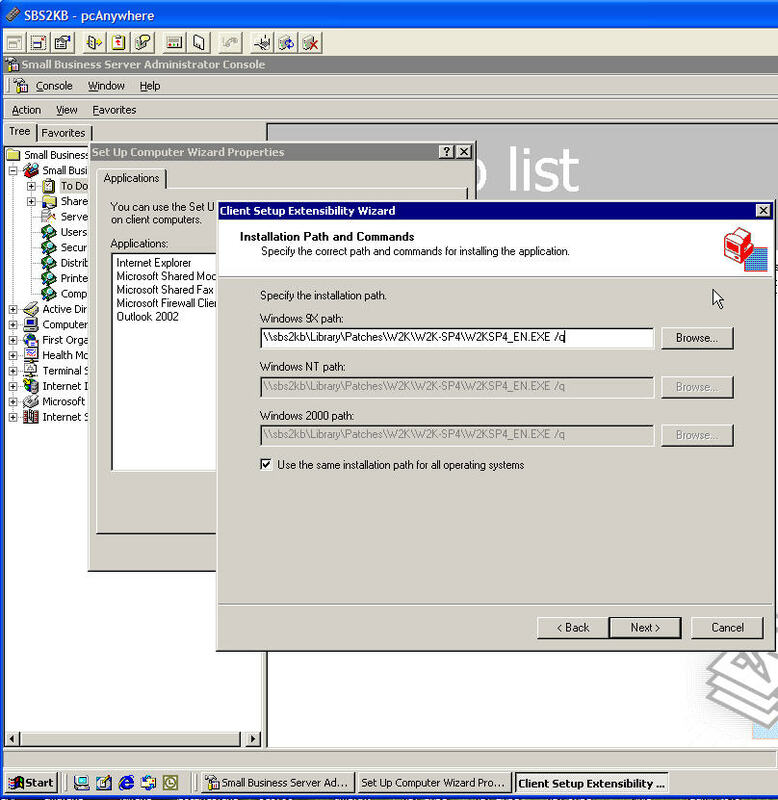 I�m sure by now you�ve heard Microsoft has taken the lid off SBS 2003 and announced 2 versions and increased the user limit to 75. Pricing is not official yet but rumor is the standard edition will hover around $1000.00 and the Premium Edition will be about the same pricing as SBS2000. For the differences between the versions take a look HERE. I have been using the beta on my test network for quite a while now and must admit it is a ,big step forward. No more magic disk, just point to a local URL. Your main SharePoint Site is up and running out of the box. And your traveling workers will love the new Remote Web Workplace which delivers their desktop to them on their Laptops running XP. I am still waiting for RC1 to be delivered so I'll have more on the final features and functionality after it arrives. if you'd like to order the preview kit click HERE. Don't forget the good folks at Microsoft once again extended the SBS 2000 Channel Services Rebate program. Now you can make qualified sales up to 9/30/2003. Well if you haven�t heard SBS Guru extraordinaire Harry Brelsford is holding the first ever SBS conference which is going to be a real shindig. Harry is calling it SMB Nation and melding the small and medium business markets. With the positive reaction so far, his plans to make this an annual event should be no problem at all. The event is happening in Indianapolis and includes not only technical sessions but also business sessions with tips on how to successfully run a consulting business. And of course since it�s in Indy there is a tour of the track and BBQ included with the conference package. And the timing couldn�t be better with SBS 2003 scheduled to hit the streets about the same time as the conference. And as part of the fun they will be building a rolling SBS 5 user network and filming the process for submission to the Discovery Channel�s Monster Garage program. Yes yours truly will be there answering questions and lending a hand in the background, I was invited to speak but struck with stage fright when I heard of the size of the crowd of SBSer�s expected to attend. You can get all the details and sign up to attend HERE.